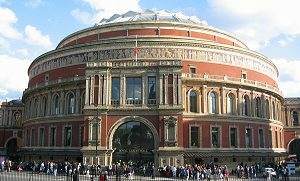 It has been announced that due to exceptional demand for the three nights that David Gilmour is performing at London's Royal Albert Hall on September 23rd-25th, two further nights have just been added. Tickets for these additional concerts - on October 2nd and 3rd - go on sale now through the normal ticketing outlets. They have pointed out that "for the London concerts, the name of the lead booker will be printed on each ticket. The lead booker must attend the concert and photo ID will be required to gain entry to the venue. There will be no exceptions to this rule. This is to try and stop secondary selling by ticket touts at high prices." This is exactly what happened with the Kate Bush concerts in London last year, and it seemed to work really well. It ensured that fans were there, and ticket touts/scalpers didn't get much of an opportunity to make a killing buying tickets for a show they would have no intention of seeing! You can place your order for tickets to all the London shows through these links: Ticketmaster, Eventim, Seetickets, Stargreen and RoyalAlbertHall.com although please be aware that demand is incredibly high so you might need to be patient and keep retrying, as they seem to be adding tickets for sale progressively.